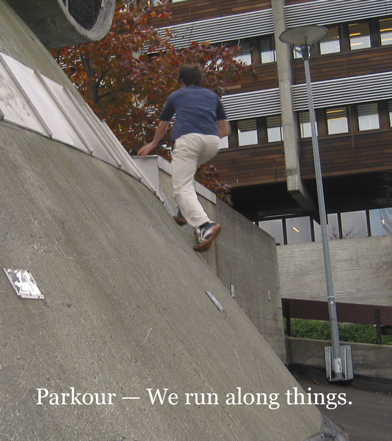 Most nerds loathe, shun, and shirk physical activities. In this aspect of nerdhood, my personality strays away from the norm somewhat; I don't hate using my body, and under the right conditions, I enjoy it. I hate lifting weights and moving furniture (because those are repetitive activities), but I enjoy jumping around and using my environment (it's fun to figure out how to best clear an obstacle). My parents tell me that when I was very young they used to find me in the weirdest places (including display windows, dangerously high plant fixtures, and, later, rooftops). 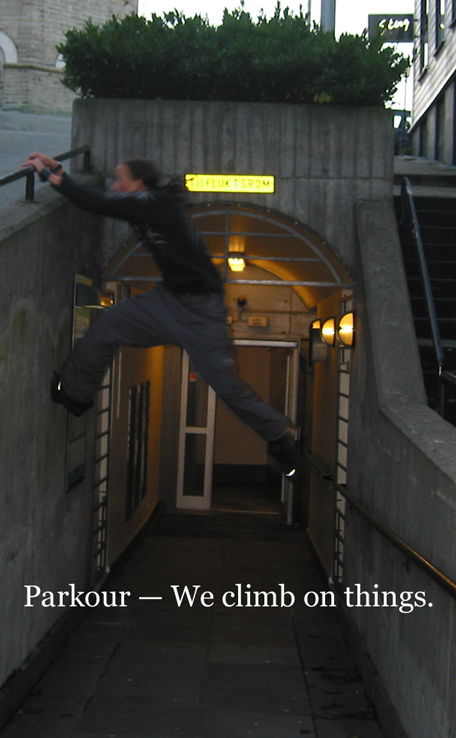 You are not David Belle. 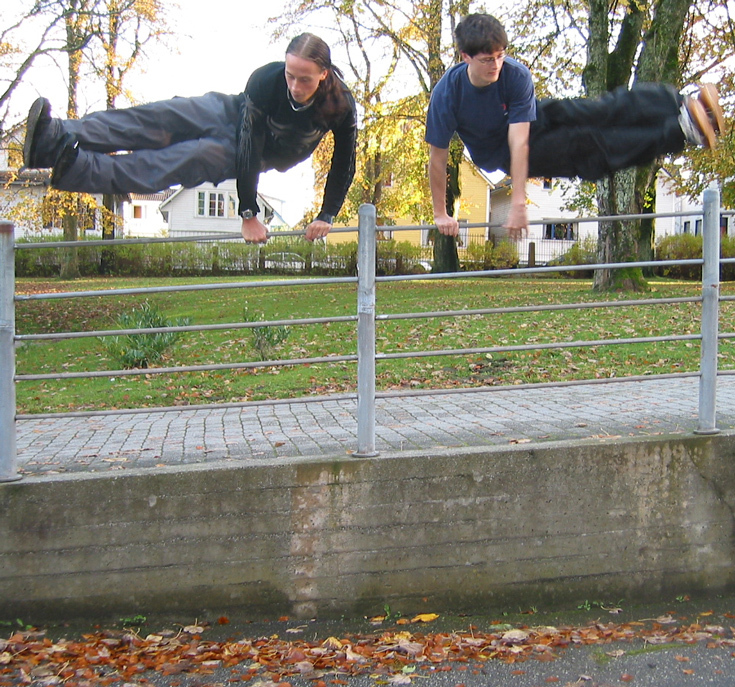 David Belle is insanely fit, and trying to imitate him if your physique is below his is dumb. 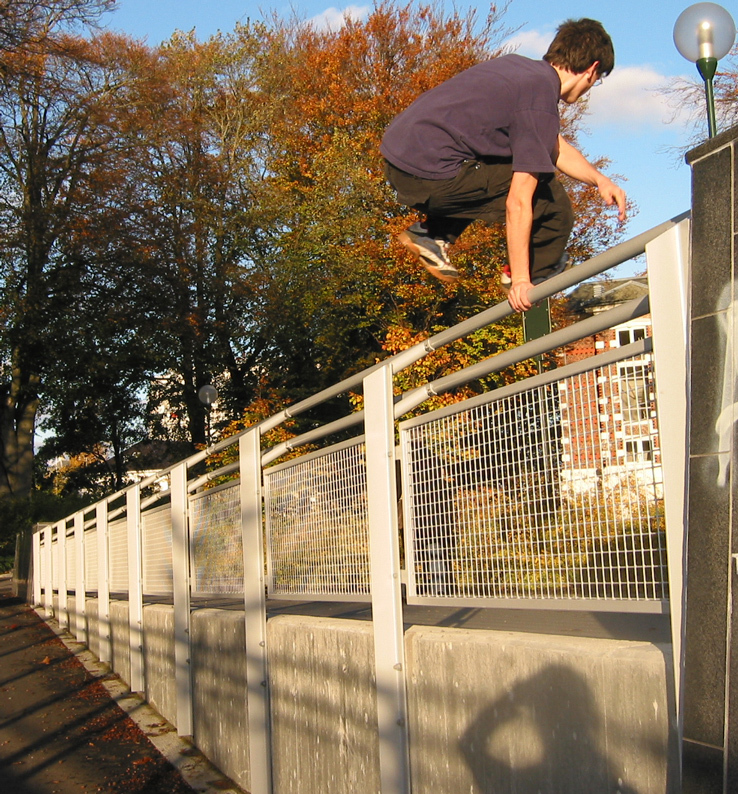 Therefore, do not try to jump gaps that he clears seemingly easily. Check your obstacles for deficiencies before doing anything to them. If you're planning on vaulting a fence, test its sturdiness. If it's loose, you're in for a surprise. If it's wet or icy outside, stay inside and play Half-Life 2. Falling hurts. Don't try something you're not confident you can do. In particular, don't let your peers talk you into doing something you're not confident you can do. 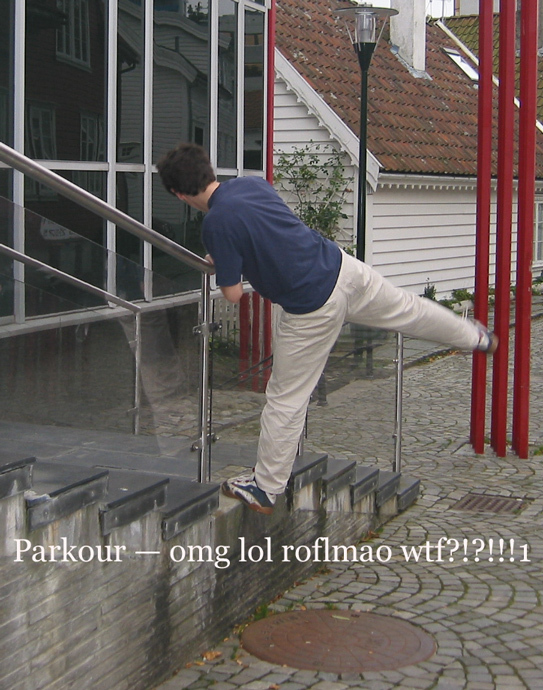 These are images of Andreas and me doing parkour in Stavanger. 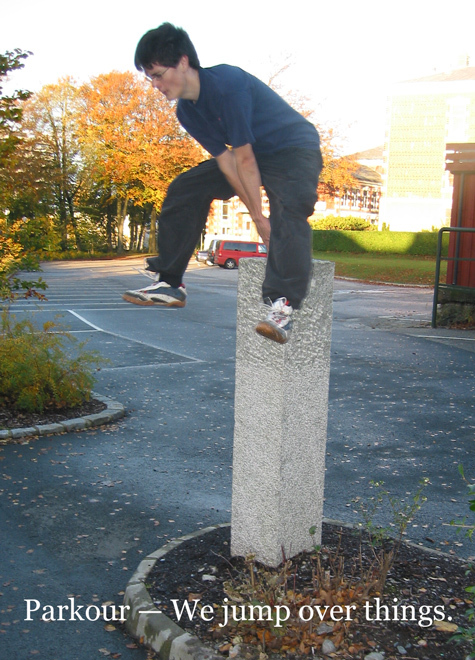 Andreas performs a gate vault. Håvard and Andreas perform rocket vaults. Håvard and Andreas perform gate vaults. 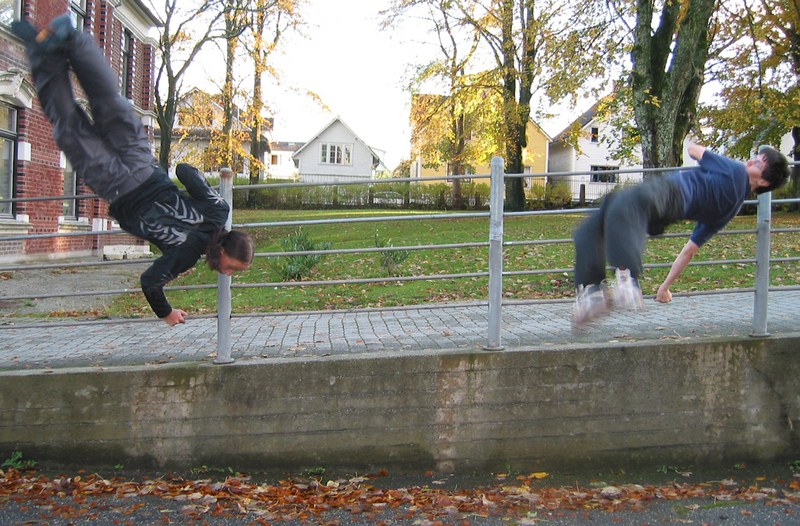 Håvard performs a reverse vault. 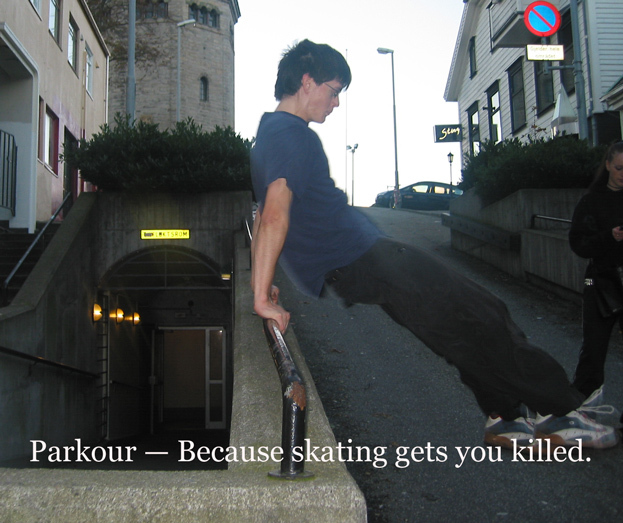 These are quasi-ads for parkour that Andreas and I made. 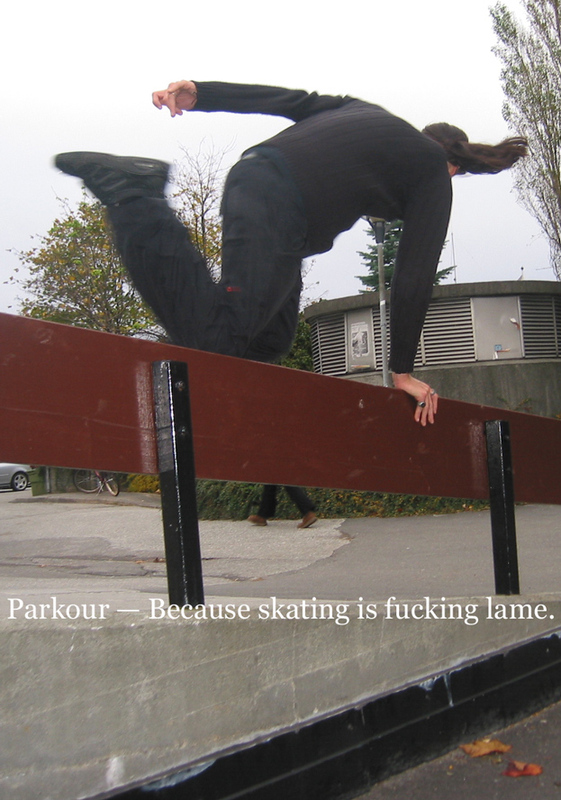 It should be noted that I'm indifferent to and ignorant about the skating culture, and I chose to make fun of it simply because parkour is often described as skating without a skateboard.